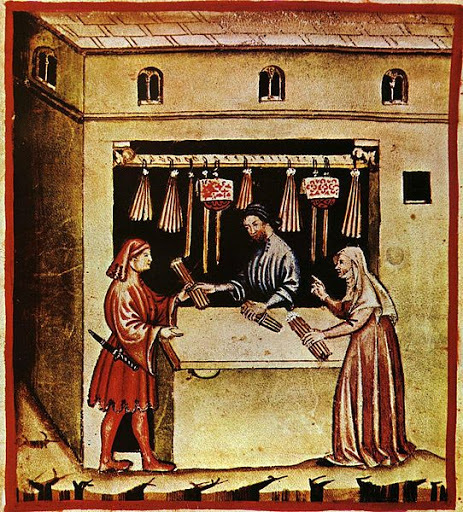 Apropos nothing in particular, here is a picture of a medieval shopkeeper selling torches (picture courtesy of wikipedia). I was inspired to post this by Mythmere’s bit on torches on his blog. Looking at the picture, I wonder if the woman is saying, “You know, underneath this gown and wimple I am wearing a chainmail bikini.” Plus, in the picture it looks like “Ye Olde Torche Shoppe” is right on the edge of a cliff — the customers have to stand really close to the counter to keep from falling to their deaths. Only at Costco where you can buy torches in bundles of 60, lamp oil in 5 gallon jugs or enough diapers in one box to get your kid to age 12. Yes, we are so spoiled in our modern times, as we have our “level ground,” and our “railings”. You could not be clumsy in those days – you had no safeguards back then!